A few weeks back I visited the New Orleans Museum of Art. Like any self-respecting American art museum, NOMA holds several shipwreck-themed objets d’art. A fellow shipwreck enthusiast spied the most impressive on the second floor balcony. 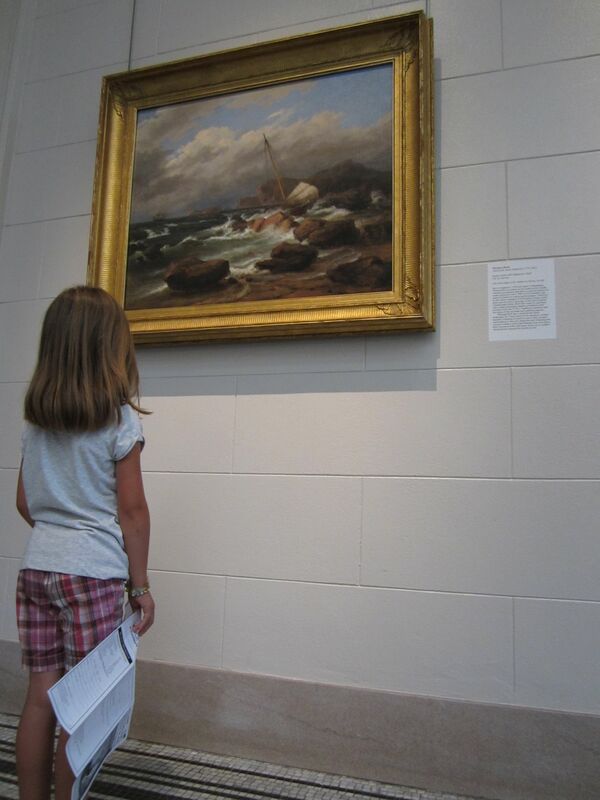 There she stood in rapture, fully taken by Thomas Birch’s 1849 oil painting Rocky Coast with Shipwreck. Who could blame her? An epic, Romantic image. A timeless topic. Another world for a NOLA five-year old. The Mariner’s Museum in Newport News, Virginia, recently put up a new shipwreck-themed exhibit. Titled “Abandon Ship: Stories of Survival,’ the display includes a vest [pictured above] worn by a survivor of the recent Costa Concordia wreck! The new exhibit, which runs into next year, is the museum’s first new exhibit since 2010. Timed to coincide with the 100thanniversary year of the Titanic’s sinking, the $250,000 exhibit uses words, images and audio recordings to capture the first-person accounts of shipwreck survivors and rescuers. “This is not about shipwrecks,” said Lyles Forbes, the museum’s chief curator. “The shipwreck is where our stories begin. These are stories of survival, raw human emotions and people’s reactions when put in desperate, dangerous situations. You can find the exhibit website here. Featured in the exhibit are 36 sketches by artist Richard Wells, illustrator for “A Guide to Shipwreck Sites Along the Washington Coast” published in 1989. Wells’ works are finely detailed pen and ink drawings of ships at their wreck sites. His drawings display scenes ranging from 1775 to 1965, including two historic wrecks from 1896 and 1936 of the Potrimpos and the Iowa. The Potrimpos wrecked in 1896 after drifting into the Long Beach Peninsula while waiting for a cargo pickup and the Iowa was stranded on a sandbar at the mouth of the Columbia River in January 1936. Wells’ original illustrations were donated to State Parks after they were published in 1989. Admission to the center is $5 per adult and $2.50 per child ages 7 to 17. Children 6 years and younger enter for free. The interpretive center, which sits on a 200-foot bluff overlooking the Pacific Ocean, is worth the price of admission alone. With March Madness over, we’ve transitioned to April (or Titanic) madness. Titanic 3D opens today to kick it off. The reviews are in and they’re good/borderline great. The film’s stars have appropriately reminisced. Its scarlet has compared her role to a “bit of a shipwreck.” Unfortunately, I don’t think my grad-student expense account can handle those 3D tickets. Tell me what ya’ll think about it! Elsewhere in Titanic-land things are heating up. Archaeologists are reporting fascinating finds from the wreck site. My favorite is a pipe, possibly from the liner’s bridge officer William Murdoch, who was harshly portrayed in Cameron’s Titanic. A new Titanic museum is opening in Southampton, England next week. MTV is actively promoting its Titanic Sounds festival set for April 13th in Belfast, Ireland. Its touted as a “pop festival” with acts including Pixie Lott, Katy B, Olly Murs, Sean Paul and Rizzle Kicks performing. (Why Belfast? Because the Titanic was built there). The winning bid for the titanic Titanic auction will be unveiled two days before the Belfast shindig. There’s more… lots more. I’ll post all I come across in the days to come. (If you find something interesting — please pass it along!) What ever will we do after April 15th?